A unified commerce platform is not simply the future in-store or web platform, but combines POS, mobile, Web, call center and clienteling into one single integrated platform. It has become the new retail imperative. According to a new special report from Boston Retail Partners (BRP), retailers recognize the need for a holistic customer experience that transcends channels, but most attempts are falling short. 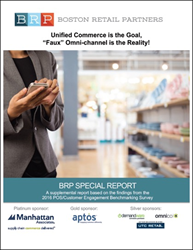 According to the BRP SPECIAL REPORT: Unified Commerce is the Goal, “Faux” Omni-channel is the Reality, many retailers have taken the “just get something done” approach over the last few years to attempt to deliver a cross-channel customer experience. The unfortunate result of this quick fix approach is a “faux” omni-channel model that doesn’t execute as promised and risks disappointing customers. Unfortunately, the risk of losing customers due to a disappointing shopping experience caused by flawed omni-channel architecture is deadly – this is why retailers are focusing on “real” unified commerce in 2016. This Special Report provides insight into BRP’s 2016 POS/Customer Engagement Survey and highlights the unified commerce objectives and challenges facing leading retailers today. The Special Report sponsors are Manhattan Associates (platinum), Aptos (gold), Demandware (silver), Omnico (silver) and UTC Retail (silver). For more information on BRP, visit http://www.bostonretailpartners.com.